These Sidewalk Signs Come in Various Sizes! 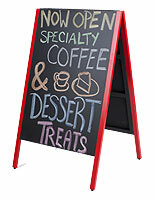 Use These Sidewalk Signs to Promote Your Business Outside Your Storefront! 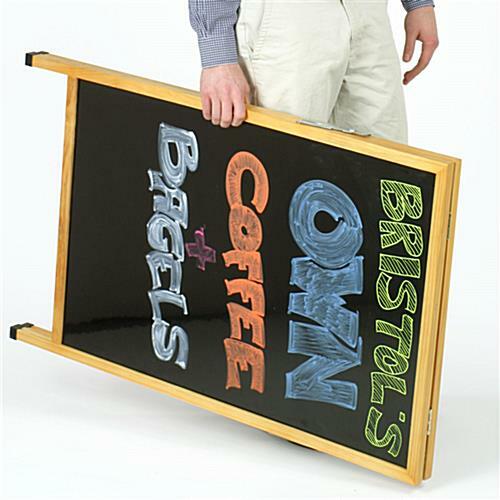 These sidewalk signs, marker boards are high quality advertisement displays. 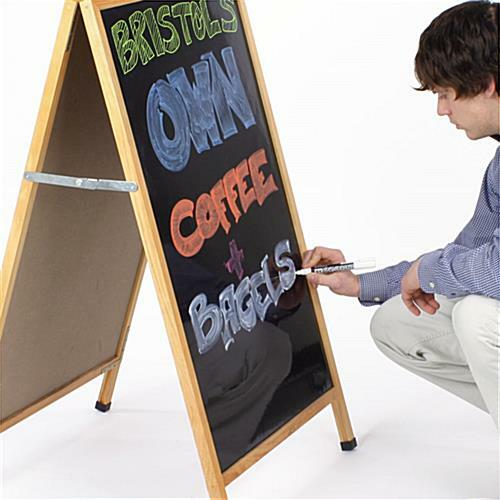 The marker boards have two sides write–on surfaces, perfect for advertising multiple promotions. The marker boards, such as dry erase boards, A-frame signs or sidewalk signs are used by many different businesses. 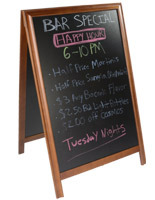 Restaurants, bars, clubs, and hotels all use these marker boards, for example. Change messages as often or as seldom as you like, with ease! 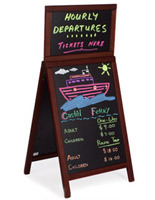 The wood frame marker boards are portable signage solutions. 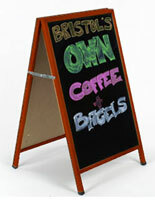 The sidewalk signs, marker boards feature piano hinges, allowing them to fold up and be moved easily. 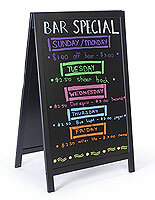 The black marker boards have a large, 23-3/8" x 35-1/2", writing surface. 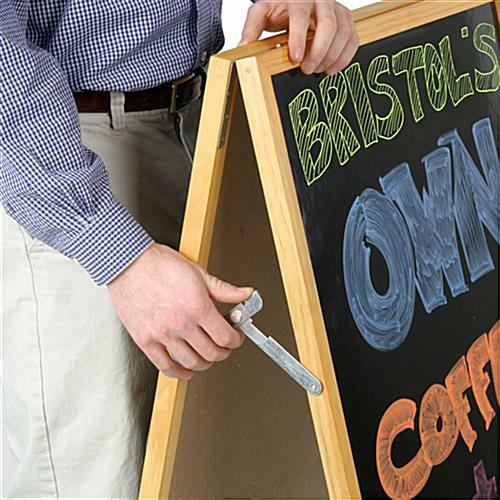 The sandwich boards, menu signs, A-frames and other marker boards are made with a no-streak, smooth glossy surface for easy cleaning. 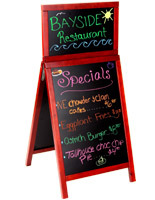 Use wet markers with the marker boards to display menu additions, specials, promotions and greetings. 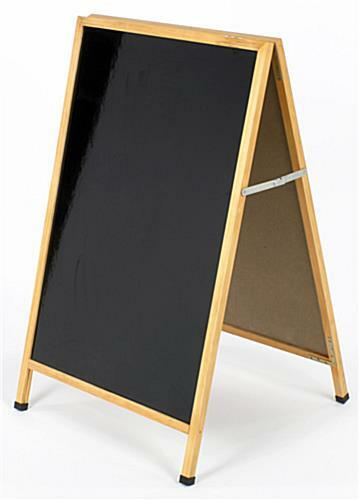 Please Note: The black board surface of this marker board is a wood-substrate, and is meant primarily for indoor use. The marker board can be used outdoors, however, we recommend bringing it inside during inclement weather. As with other wood-based products, the wood expands and contracts in different weather conditions. This may cause "checks" or imperfections in the wood. 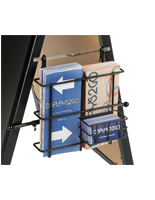 The "checks" in the wood are not noticeable from a distance, and with our affordable pricing, you won't find any other write-on boards that can compare. 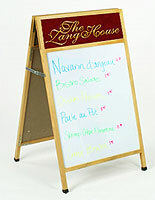 In addition, these marker boards are meant for use with our neon wet-erase and liquid chalk markers. 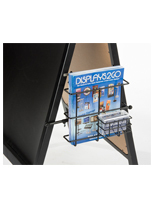 They are not meant for use with dry-erase markers, as these will leave a residue and not wipe clean.